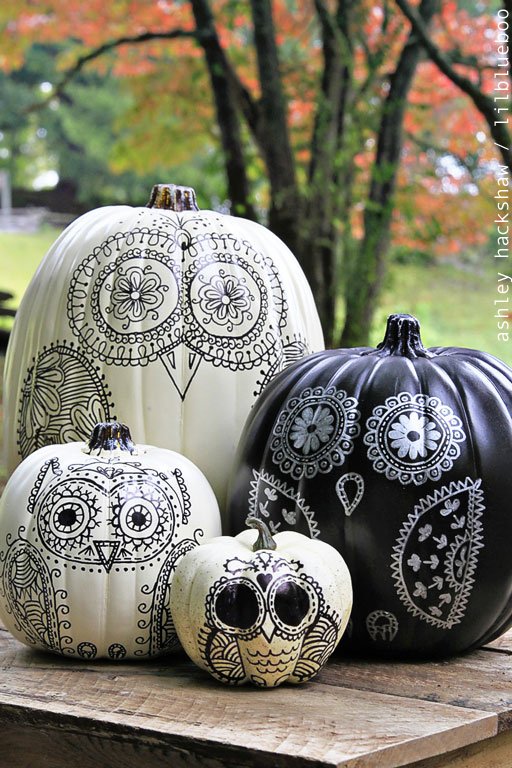 Artist, writer and historian of stuff, Ashley Hackshaw, drew out these delightful sharpie owls on styrofoam pumpkins, presenting them as a “DIY” in 2014 on her blog site: LilBlueBoo.com. I love how the eyes of these owls look like little delicate mandalas and the wings look like sections of mandalas. Even the smaller pumpkins take on my favorite circular shape. I am a big fan of Mexican art…especially sugar skulls. I used black and silver Sharpie markers to turn these faux styrofoam pumpkins into owl sugar skulls for my Halloween decor this year. How fun is this project! I love the idea of taking a blank “canvas” and making it your own. For me, I think I would doodle out one long line all over the pumpkin and then color in each of the sections created from any cross-overs. What would you draw out on your pumpkin?